This is if you want to make pizza at home. For an 8ft, pizza by Dirt Road Cookers, please contact us or call Kurt today. It's easy to check our calendar and then book a pizza party! Preheat the oven to 400 degrees. The oven should be piping hot before you start cooking the pizza. Prepare the crust. Remove the unbaked crust from the packaging. Place it on a round baking sheet or a rectangular baking sheet, depending on what you have on hand. Use a pastry brush to spread a thin coating of olive oil over the top of the crust. Spread pizza sauce on the crust. How much pizza sauce you add is purely a matter of personal preference. If you love a lot of sauce, go ahead and slather it on. If you prefer your pizza on the dry side, spoon a little in the middle and spread it around in a thin layer. If you want to make a white pizza, add a little extra olive oil and skip the pizza sauce. You can make a quick pizza sauce using tomato paste, a can of diced tomatoes, and some spices. Simmer the paste and tomatoes (without draining them first) together over low heat. Add salt, oregano and pepper to taste. Continue simmering until the sauce cooks down to the consistency of pizza sauce. Add toppings. Layer your favorite toppings over the sauce. Add as many or as few toppings as you want. Put the heavier toppings, like onions, chicken or sausage, on the bottom layer, and add lighter toppings, like spinach leaves or peppers, on the top layer. Continue until your pizza is loaded with the amount of toppings you like. Aside from pepperoni, which is pre-cooked, meat toppings should always be cooked before you put them on the pizza. They'll get reheated when you bake the pizza, but they won't fully cook. If you're using ground beef, sausage, chicken, or another meat, brown it thoroughly on the stove and drain the grease before you add it to your pizza. 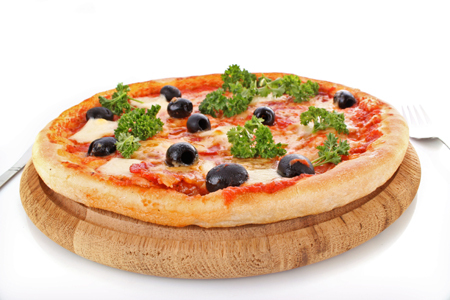 Remember that if you add too many vegetable toppings, your pizza's crust might turn out a little soggy. The water from the vegetables moistens the dough. Limit the amount of spinach and other "watery" vegetables you put on your pizza if you're worried about this happening. Add the cheese. Sprinkle mozzarella cheese over the toppings. Layer it on thick if you like it that way, or add a thin layer if you're going for a lighter pizza. Cook the pizza. Place the pizza in the oven for about 20 minutes, or until the crust is golden brown and the cheese is melted and bubbly. Remove it from the oven and allow it to cool for a few minutes before slicing. Proof the yeast. Place the warm water in a large mixing bowl. Pour the yeast onto the water and let it sit until it dissolves. After a few minutes the yeast mixture should begin to bubble. Add the other dough ingredients. Put the flour, olive oil, sugar, and salt in the mixing bowl with the yeast mixture. Use the dough hook attachment on your stand mixture or work by hand to stir the ingredients together until a wet dough forms. Keep mixing the dough until it becomes smooth and elastic. If you're working by hand, the dough will become difficult to stir when it starts to thicken. Put down the spoon and knead the dough until it reaches the right texture. If the dough looks wet after you've been mixing or kneading it for a long time, add some flour to thicken it up. Let the dough rise. Form it into a ball and place it in a clean mixing bowl coated with a little olive oil. Put a drape a dish cloth or plastic wrap over the bowl and place it in a warm part of the kitchen. Let the dough sit and rise until it has doubled in size, which should take about 2 hours. You can let the dough rise in the refrigerator instead. This takes about 6 - 8 hours. You can also freeze the dough before it rises and let it rise when you're ready to make pizza. Preheat the oven to 425 degrees. Do this well before you're ready to bake the pizza, so the oven has plenty of time to get quite hot. If your oven tends to run cool, turn the temperature up to 450 degrees. If you're using a baking stone or pizza stone, place it in the oven so it gets preheated as well. If you're using a baking sheet, place it in the oven at this time. Form the crusts. Divide the dough into two equal parts and shape them each into balls. On a floured work surface, roll out the first ball of dough into a circular shape, or use your fingers to stretch it out and shape it. If you're feeling ambitious, you could also try tossing the dough to form it into a pizza shape. When you're finished with the first crust, make the second. Get the crusts ready to bake. Use a pastry brush to spread a thin coating of olive oil over the tops of the crusts. Topping the pizzas. Spread homemade pizza sauce (or sauce from a jar) onto the crusts. Layer on your favorite toppings, making sure not to go overboard or the crusts won't get crisp. Finish by sprinkling on your favorite type of cheese. Bake the pizzas one at a time. Carefully remove the baking sheet or stone from the oven and sprinkle it with some cornmeal (or reach into the oven to sprinkle it on). Transfer the pizza to the baking stone or sheet, and place it back in the oven. Bake for 15 to 20 minutes, or until the crust is golden and the cheese is bubbly. Repeat with the second pizza. If you're using a baking peel, transfer the pizza directly from the peel to the stone in the oven. Baking peels are used by professional pizza bakers along with baking stones. The unbaked pizza is assembled on the peel, then transferred to the stone in the oven.